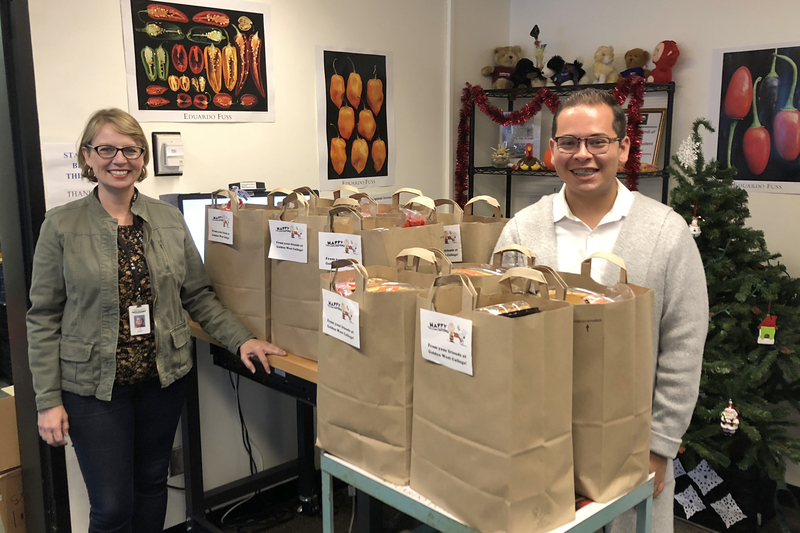 Jill Kiefer, GWC Student Services and Salvador Cerda-Rodriguez, GWC Student Equity, pack Thanksgiving bags at GWC’s food Pantry “The Stand”. Thanksgiving is a time when most of us gather around the dinner table with family and friends and celebrate what we’re grateful for. But for those less fortunate, especially students in need, this time of year may be a reminder of the obstacles and hardship in their lives. This year, the staff and students at Golden West wanted to support those students and provide them with a Thanksgiving meal – a small reminder that they’re part of the GWC Family, and we take care of our own. GWC Student Equity, in partnership with EOPS, DSPS and the Financial Aid Homeless Liaison, identified students who may not have access to a traditional meal, and packed dozens of bags full of classic staples so they can enjoy a Thanksgiving dinner. GWC staff and student volunteers assisted in shopping for groceries and assembling the Thanksgiving bags, which included canned vegetables and fruit, instant potatoes and stuffing, gravy, salad, rolls, brownie mix, pumpkin pie and more. Located next to the Student Services Center in the heart of campus, “The Stand” is a free food pantry for all currently-enrolled students at GWC, providing them with a wide variety of healthy groceries and snacks to meet their nutritional needs. In addition, GWC’s professional closet, “The Rack,” (located right next door to “The Stand”) provides free clothing for currently-enrolled students who need professional attire for an interview, job or event. GWC Student Services will be collecting winter outerwear to give to students at “The Rack” before the winter break. For more information about GWC’s Student Equity, “The Stand or “The Rack,” please visit goldenwestcollege.edu/student-equity. In the 1980’s Community Services sponsored family oriented movies in the outdoor amphitheater on the weekends during the summer. The Sound of Music brought in 850 people.